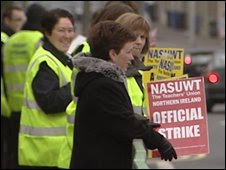 The teachers at Movilla High School in Newtownards, Co Down have been out on strike for over a week following the failure of the local education board, SEELB and the school governors to deal with a pupil who it is alleged assaulted a teacher. The union, NASUWT, has made public guidance from SEELB, which advises that teachers should not get within 3 feet of the student, so that he cannot grab them! Now the NI Children's commissioner has been all over this case...claiming that the child's right to an education has been damaged by the teachers' union, NASUWT, with little or no comment about the needs of the young person to have a supportive education package or indeed the rights of the other students to not live in fear of one pupil.